When Carlitos's mother and the other cleaners go on strike for higher wages, Carlitos cannot think of a way to support his mother until he sees her on television making a speech, and then he gets his class to help him make a sign to show his pride. Carlitos is a young character whose mother works as a janitor at a local skyscraper in Los Angelas. His mother struggles to take care of her family, with barely any help from the wages she makes at work. One day her, and other janitors go on strike to achieve better work conditions. When Carlitos goes to school he finds that he is not the only student whose family is affected from the strike. He shares pictures with his class about the strike. His class helps make signs for the strike. This story personally touches me because I have had to work at low paying jobs to support my family. It shows no matter what culture you come from, at times you may have to struggle to support family. The illustration are well portrayed of the story. The story has lots of conflict involved as the characters try to take care of their loved ones. This story has both English and Spanish text. Sí se peude is a book written in both spanish and english. It tells of a mexican mother who goes on strike because she is not making enough money to take care of her mother and son. This book is great for children learning either english or spanish because they are printed next to each other. 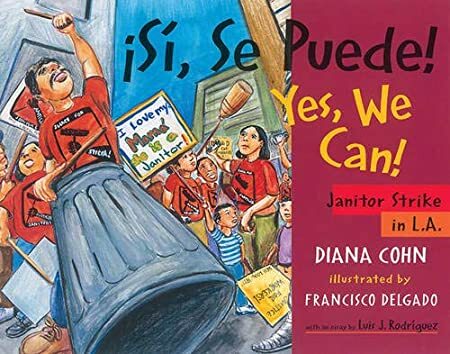 I did not happen to like the idea of activism in a children's book, but I can see how it is important, especially now with more immigrants in this situation in our country. Summary: This bilingual book is about a boy named Carlito and his family, who struggle to keep their lives going. Carlito's mother tucks him in every night before she leaves to go clean offices, and then she returns to put him on the bus with his grandmother, or abuelita, before she sleeps during the day. One day, Carlito's mother decides to get a group of workers and go on a strike for higher pay. Carlito is told by his mother that she will need his help, and Carlito has an idea to gather his classmates to make posters for the strike. The strike is a success, and Carlito's mother now has a higher pay that allows her to have more time to spend with her family, and pay for Abuelita's health care. True scenarios and stories of many families where kids see their mom/dad go to work and part of the custodial workforce. Like so many workers some are underpaid, overworked and unappreciated. In this story Carlito helps him mom, who is joining group to strike in L.A., in great show of solidarity. Great conversation starter (lesson) about economics, social class, activism, government, civil rights, union, classism, gender. Great for dual language. Book tackles real world issues that kids can comment on. This wonderful biography retells the story of a woman named Dolores. She is a janitor who is not paid enough so she goes on strike with the other workers to get a raise. This is a wonderful book about hope and perseverance.